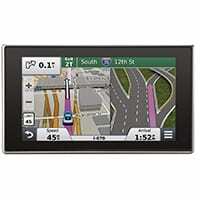 When it comes to quality in-car GPS systems, Garmin, TomTom, and Magellan know what they are doing. You'll find details on some of their best models below. We’re willing to bet you spend a lot of time behind the wheel. From work commutes to weekend family visits, we all rely on our cars to take us everywhere we need to go—and that’s usually a lot of places. 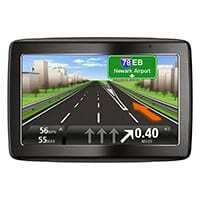 If you’re looking for a way to make all this travel a little easier, you’ll probably love using a navigation system. A navigation system for your car can help you travel safely, avoid traffic, and optimize your route for better driving. Prices effective as of December 16, 2018. Offers and availability subject to change. Complete with a built-in dash cam, the Garmin nüviCam LMTHD offers an incredible overall user experience and comes with several features to help you drive a little safer. While the battery life is not great—it only lasts up to thirty minutes—the device comes with a magnetic windshield mount which automatically charges your navigation system. The built-in dash cam is a great feature, but is positioned too low for some car models. 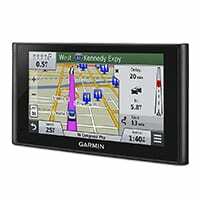 The Garmin nüvi 3597LMTHD comes with an easy-to-use interface and sleek design, which makes it an appealing choice for those who want a simple navigation system. The device magnetically attaches to your dash cradle, and is easy to remove and replace with one hand. Voice command capabilities make hands-free searching easy, and you can even search for a variety of locations of interest that come preloaded—or add your own to the database. The Magellan RoadMate 9612T-LM is one of the largest GPS systems for cars. With a seven-inch screen, the RoadMate is perfect for those who have a hard time reading smaller text. The device is compatible with several kinds of mounts, and comes with free map updates and traffic alerts for its lifetime. A unique benefit of the RoadMate is that it can show buildings and landmarks in 3D—which may help you better navigate around town. 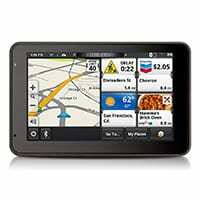 The Magellan SmartGPS 5390 syncs with the Cloud to give you accurate and up-to-date route and destination information. While the device can be used alone, you’ll get optimal performance if you use it with Magellan’s SmartGPS Eco software that syncs your smartphone, computer, tablet, and Magellan SmartGPS together. The product design leaves a lot to be desired: it is nearly seven inches long, but the screen takes up only five inches. Unfortunately, this can make the screen look cluttered and unclear. The TomTom VIA 1535 comes with comprehensive traffic data to help you avoid traffic jams. The sleek design isn’t cluttered with unnecessary buttons, and the real-time map will help you navigate current conditions with ease. Another great feature of this device is that it offers split-screen view: you can see a bird’s eye picture and what’s happening right in front of you at the same time. Even if you’re a careful driver, it never hurts to have a little extra help staying safe. Some driving conditions are outside your control, but GPS systems can help you navigate them with ease. Getting lost makes you late and can land you in dangerous neighborhoods or environments. By knowing exactly where you are going and using a navigation system to help you get there, you can stay out of potentially harmful situations. Many GPS systems take local traffic into account when planning routes. More traffic provides more opportunities for accidents to happen, so staying out of heavily congested routes means you’re more likely to arrive at your destination safe and sound. Navigation systems narrate directions to you as you are driving, so you don’t need to look at your phone and take your eyes off the road to figure out where you are going. An added bonus is that many GPS systems for cars respond to voice commands. Some newer navigation systems come equipped with several safety features. These can range from speedometers that alert you when you exceed the speed limit to proximity alerts when something gets too close to your vehicle. GPS systems come in many shapes and sizes, and some are designed for specific situations. Make sure you find one designed for automotive use, as a hand-held system or GPS watch won’t help you while you’re driving. Here are some other factors you’ll want to consider when looking for a navigation system. 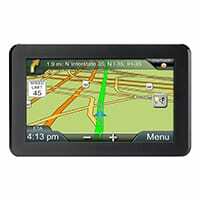 When comparing GPS systems, make sure the screen size fits your vehicle. Also consider the image resolution as it’s important you can see your route map with ease. Many GPS systems will change routes to avoid traffic jams. Depending on where you live, this may be an important feature for you. Some navigation systems have the ability to connect to several satellites quickly, while others may react slower. Your navigation system needs to stay up to date on the most current road conditions. Roads change with construction, accidents, and obstructions. You need to make sure the road you’re turning on still exists and isn’t blocked by anything. An added feature on some navigation systems is that they will help you find restaurants, gas stations, and entertainment near any location. There are several navigation system options, but make sure to take your unique needs into account. Once you find the best GPS system for your lifestyle and vehicle, you can start enjoying your daily drives to work, school, and activities.